The National motto of the United States is the Latin phrase 'E pluribus unum', which translated into English means "Out of many, one". The motto 'E pluribus unum' was chosen with great care and consideration by the Founding Fathers of America. At the time the motto 'E pluribus unum' was chosen the Latin language was studied by all scholars and, traditionally, the words on European crests and coats of arms used the Latin language. 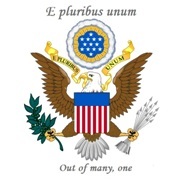 The meaning of the National motto of the United States of America, 'E pluribus unum' or "Out of many, one" encompasses the early history of the United States reflecting the many immigrants, settlers and colonists who travelled thousands of miles from all the countries in the Old World in search of a new beginning and better life in America. E pluribus unum - "Out of many, one"
The early colonists and emigrants came from many countries and spoke many different languages. The National motto of the United States of America was originally used in reference to the integration of the original 13 independent colonies into the one united country of America. It also reflects the amalgamation of the people and their adoption of the English language - they became Americans. The Great Seal of the United States of America is one of the most important symbols of the USA. We have detailed facts about the history and adoption of the national US motto in an easy question and answer format. The choice of 'E pluribus unum' meaning "Out of many, one" was both an important and difficult task. The men who formed the Continental Congress wanted a National motto that would stand the test of time and remain relevant to future generations of Americans. They needed a National US motto that, in a few short words, would to encapsulate the beliefs, inspirations, interests and the ideals of the people of America. They succeeded! The inspirational choice of 'E pluribus unum' meaning "Out of many, one" is brilliant. Can you think of a better National US motto than E pluribus unum? We hope that the facts and information on E pluribus unum will prove helpful to kids, school children and schools. The E pluribus unum motto is still relevant in modern America, just as the Founding Fathers would have hoped..
What does E pluribus unum mean? The Latin words 'E pluribus unum' means "Out of many, one"
The meaning of 'E pluribus unum' meaning "Out of many, one" reflects the aspirations and achievements of the America. Why did the new nation need a National US Motto? To adhere to the tradition of existing countries by adopting a motto that represented the ideals and achievements of the new nation of America. 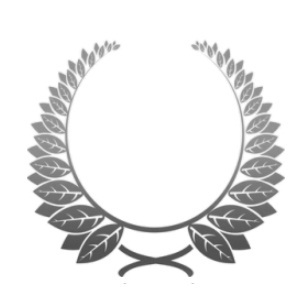 Who was given the task of creating the Great Seal and the US Motto? Who was Pierre Eugene du Simitiere? The tradition of using of heraldic symbols as a means of identification spread throughout the European nobility in the 1400's. Who submitted the idea for the US Motto 'E pluribus unum' meaning "Out of many, one"? When was the 'E pluribus unum' motto submitted to the Continental Congress? 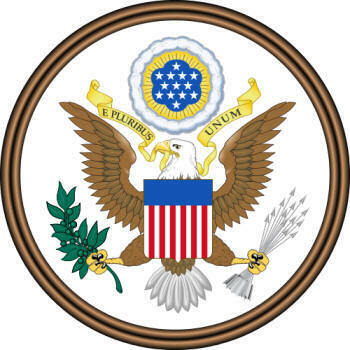 The recommended motto of 'E pluribus unum' was immediately agreed by Congress, but it took another six years for the design of the Great Seal to be agreed! Where does the National US Motto 'E pluribus unum' appear? 'E pluribus unum' also appears on appears on many official US documents including US passports. We hope that the above facts on the E pluribus unum will prove helpful to kids, school children and schools. The E pluribus unum motto is still relevant in modern America. US Motto 'E pluribus unum' meaning "Out of many, one"